Ah, fresh herbs. So fragrant! So delicious! Everyone loves to garnish pasta with ribbons of basil, and fresh mint leaves with chocolate ice cream is beyond yummy. We've all experienced the distinctively fresh smell and taste of homemade pesto, sauces or salsas - all made with fresh herbs! How about adding that special taste to your next salad or homemade dressing? To ensure that cutting, chopping and mincing those flavorful herbs is swift and simple, try using the handy new Herb Knife. 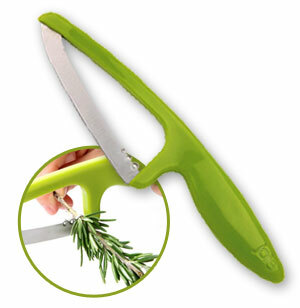 This rocking knife is an essential tool for anyone who wants to maximize the punch of fresh herbs in their cooking. The secret is the specially-designed curved blade, which cuts garden herbs quickly and easily without crushing them. All the better to season your many delicious dishes! And the ultra-sharp, stainless-steel blade, and ergonomic handle make cutting potatoes, cucumbers, carrots, and herbs a breeze! Once you own this Rocking Herb Knife you'll never want to go back to chopping herbs with a flat knife again.